Many consumers associate hospitals with the near constant spread of germs, and a recent study suggests that thought may not be too far off. According to researchers from Michigan Medicine at the University of Michigan, hospital patients were found to have superbug bacteria on their hands and on the objects they touched regularly in their rooms. The researchers were interested in seeing how bacteria was spreading between hospital rooms and patients, so they examined over 700 rooms at two different hospitals. Patients who were in intensive care or who were in the hospital because of surgery couldn’t be involved in the study, and the researchers were unable to test the rooms before patients were placed in them. Over the course of the study, the researchers sampled both the patients and the objects and surfaces in their rooms that they touched regularly to determine if there was a bacterial presence and where it originated. The researchers had a final head count of nearly 400 patients involved in the study; they found that 14 percent of them tested positive for superbug bacteria in the early portion of their hospital stay. The study revealed that the hands and nostrils were most vulnerable to the bacteria, while objects like the nurse call button were also susceptible to the germs. It also showed that superbugs can manifest over time, as six percent of patients tested positive for the bacteria as their hospital stay progressed. While this is concerning for many reasons, the researchers are concerned about the contamination of fellow hospital dwellers, as hospital patients aren’t confined to the four walls of their own rooms. The more surfaces and people they come into contact with, the greater the risk that someone can become infected. The researchers were unable to discern how the patients were contaminated with the superbug bacteria in the first place, but they hope that future studies will allow them to place a greater emphasis on germ prevention and cleaning practices. The threat of superbugs is dangerous, and researchers have proven the ways that these bacteria are harmful to consumers. Recently, the Centers for Disease Control and Prevention (CDC) found a drug-resistant fungus that could be deadly and has already affected nearly 600 people nationwide. The superbug poses the biggest threat to healthcare facilities, where the researchers discovered it, and those with weak immune systems. Last summer, researchers discovered a superbug that can withstand alcohol-based hand sanitizer. 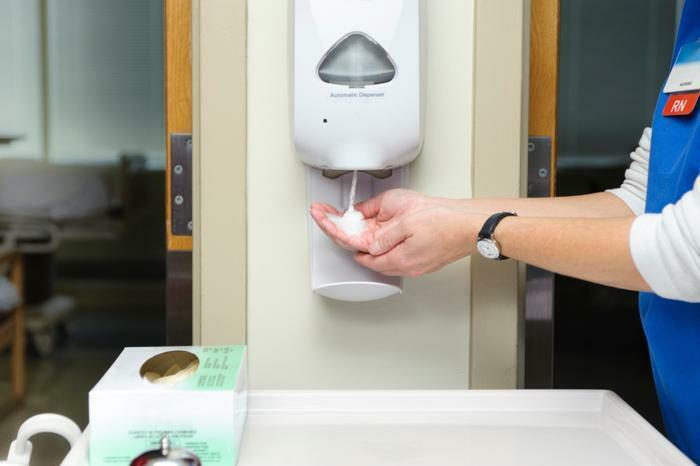 Despite the findings, healthcare experts aren’t planning on cutting ties with hand sanitizer anytime soon. "Alcohol-[based] hand-hygiene programs have been highly successful, particularly at controlling MRSA [methicillin-resistant Staphylococcus aureus], but also other types of hospital infections, and I would strongly advocate that we continue using hand sanitizer,” said researcher Paul Johnson.